Daniel Gilbert says one of the best rows of his life was when he was filling in as a cox for the U.S. Women's Eight at the National Team Training Center. Although he never competed as a National Team coxswain, he honed his skills alongside the other athletes who were training to try-out for the Team from 2007 to 2009. Gilbert then went on to coach at Hobart College, a Division III school in upstate New York. Coxing Magazine had the chance to catch up with Gilbert in his office in San Diego, where he works in the financial industry. Coxing Magazine: Thanks for taking the time to talk about your coxing, and how you developed your own skills, and the skills of the coxswains at Hobart. What was it like to cox the crews at the National Team Training Center? Daniel Gilbert : When I first got to the Training Center I wasn't allowed to have a CoxBox for over a month. It was a hard month, but it made me focus on steering the boat as well as possible. At those speeds, you really need to focus on your course. Once I was allowed to talk in the boat, I had to find a way not to lose my place or overspeak. I did the simplest thing I could do: I drew it in a square. CM: What do you mean, you drew it in a square? DG: I realized that there are four parts to the stroke, and if I focused on those fours parts, in order, I'd never get lost in my calls. 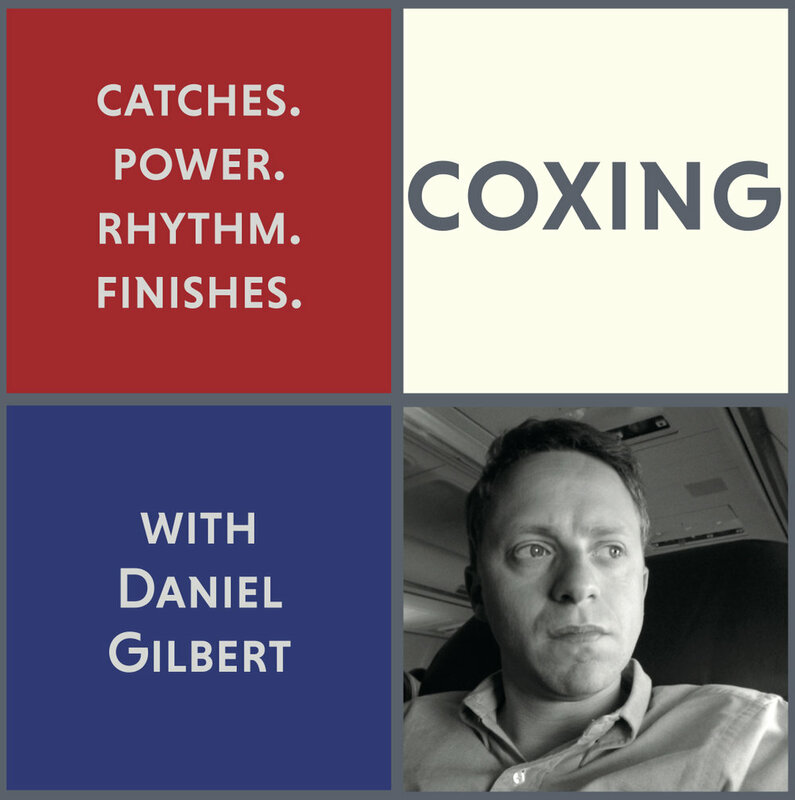 When I was coxing at the Training Center, especially in the coxed pair, I noticed that if I only focused on the catch, for instance, they'd back off on their power or they'd lose their rhythm. What came to me was "Coxing in a Square." As a coxswain, what often happens is that you 'll make a call for the crew to focus on their catches. In that focus, they might soften up on the drive, so the next focus is power. 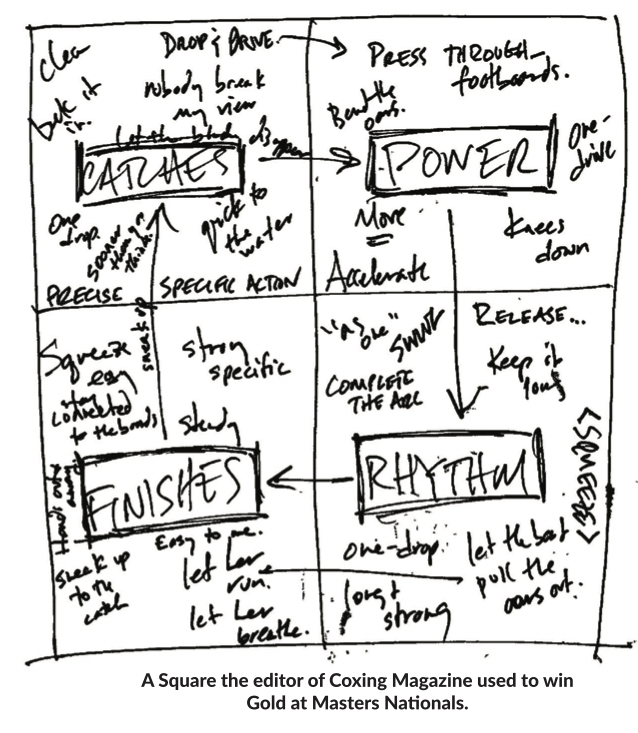 Once the power is established again, the next focus is rhythm. And that leads to finishes, which takes us back to catches. It's a square. I drew lines between each part of the progression. Then I wrote every coxing synonym I could think of for each part. You can do a whole 2k race and only repeat it four or five times. If you use all of your synonyms and use the rowers names, they won't know you're going around the Square, and you never get out of synch with what they're doing. I put it away. I didn't tell anyone about it, but it had given me the confidence to cox the National Team. DG: When I was coaching at Hobart, and was responsible for teaching coxing skills, I explained coxing this way: It's like bouncing a ball between two people: the action is rowing, the reaction is coxing. It was hard to articulate how to think about the reactions to the rowing that coxswains need to make. I went back through my notes and found a crumpled-up piece of paper. It was the Square. silence. Not the good silence, but the blank silence. She became more consistent in her calls and the rowers became more connected to her. As you advance through the levels of rowing as a coxswain, you end up homing in on the calls the rowers need. You say less, and that's why it needs to be so specific. With the Square, you can pick up from whatever part of the stroke your crew is working on. Your calls need to be specific to your crew. The Square helps you make your calls organic. If you get impassioned during a race piece, it's OK if you get lost in your calls. You have a home base... you just start again. CM: How did using the Square affect the coxswains you were coaching? DG: I think the biggest thing it does for coxswains is it lets them be in the moment. I want them to be in the moment. I want them to go after it, but they've got to be able to "bounce the ball." They've got to be the reaction to the action. As a new coxswain, though, it's terrifying because you have no safety net. The Square gives the coxswain a net. We'd laminate their Square and put it in the cockpit so it was always there for them. CM: Talk about using the Square in races. a bridge so it echoes. But these were his words, for his crew. The Square lets you find the calls for your crew. You can let yourself get into the moment because you always have a way out. You can always start back at the top. CM: Have you worked with experienced coxswains using the Square, too? DG: That's the thing, even for someone who's experienced, it' useful. Imagine training wheels turning into rocket engines. I'm not a Chip [Pete Cipollone] or a Marcus [McElhenny], but I love the sport, I love coxing, and I'm happy to contribute any way I can.